Rory C. Godowsky - Gonser and Gonser, P.A. Rory joined Gonser and Gonser, P.A. in September of 2014. 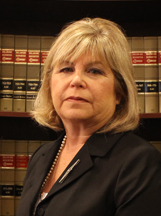 Prior to that she conducted mediations as part of her family law practice since 1992. She has extensive training in all aspects of mediation and works with families and others who are involved in conflicts. While Rory’s experience is primarily in family law matters, she mediates cases in Chancery Court as well as personal injury matters. As an attorney and mediator she brings extensive experience to the mediation table which allows her to help people resolve their differences without the need for costly litigation. She has mediated all manner of cases not just limited to family law matters. When she first began practicing law 35 years ago, she made a commitment to herself and to her clients that she would specifically try to make the process of divorce more peaceful and less emotionally charged. With this frame of mind she has devoted herself to working with her clients to amicably resolve their differences. This process allows parties to work through their conflicts and reconcile their differences. She’s been asked many times what matters can be resolved through mediation and what matters require litigation. It is her firm belief that any dispute can be resolved through mediation if the parties are willing to commit to the mediation process.